It is not the destination, but the journey. I’m probably one of the few master’s degree graduates who has been looking forward to using some of my newfound free time to keep writing. Since I didn’t have enough time before fall 2015 term started to finish blogging about my study abroad trip last summer to the Netherlands, I want to keep blogging about this trip. Due to how much interest there is in the United States to learn from the Netherlands, I plan to use specific examples from the United States and the Netherlands to show how the United States can learn from my experiences in the Netherlands. My graduation cap was inspired by my study abroad trips to Denmark and the Netherlands in 2012 and the Netherlands in 2015. The words, “It is not the destination, but the journey”, were inspired by The Slow Bicycle Movement. As I discussed in my previous blog post and the below video shows, most cyclists in the United States are too concerned about arriving at their destination as fast as possible that they forget about enjoying their journey. My study abroad experiences in Denmark and the Netherlands showed me that most cyclists in these countries enjoy their journey and don’t care too much about arriving at their destination as fast as possible. 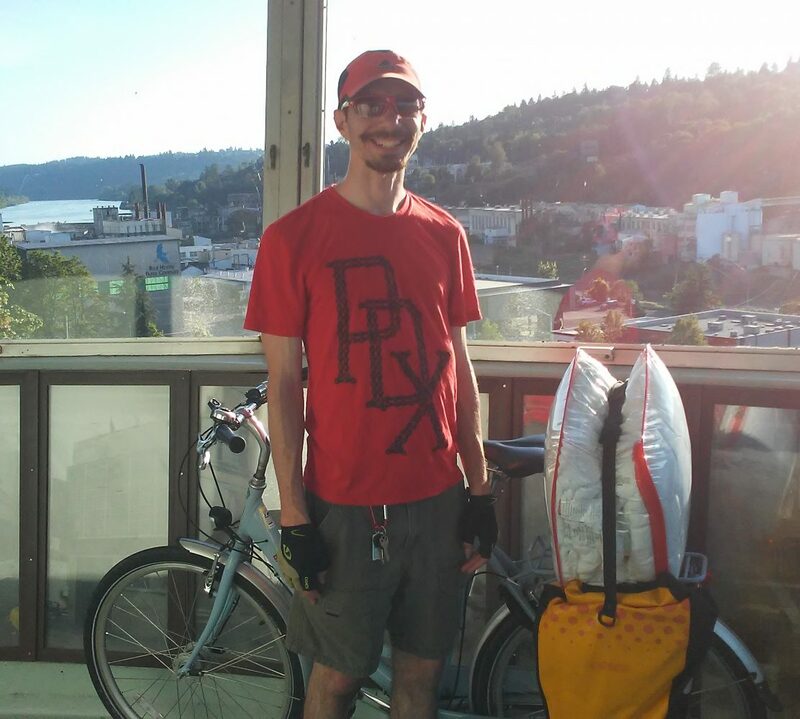 Through my bicycle advocacy work at UNC Charlotte and Portland State University, I tried to advocate for cyclists to shift from focusing on arriving at their destination as fast as possible to focusing on enjoying their journey. Wherever life takes me after graduation, I plan to continue advocating for this shift and hope to someday see most cyclists in the United States enjoying their journey. I realize world-class bike infrastructure alone cannot achieve a culture shift in the United States from fast to slow biking so we need local, regional, state, and national comprehensive bike plans. Through my next blog posts, I plan to show how the Netherlands created and has been implementing local, regional, provincial, and national comprehensive bike plans. Since the United States is light years behind the Netherlands when it comes to local, regional, state and national comprehensive bike planning, I also plan to show how the United States can learn from the Netherlands. I returned to Portland about a week ago from the Netherlands. While I miss the connected network of protected bike lanes and protected bike intersections that I biked on daily in the Netherlands, I’m thankful to still have traffic calming in Portland. Since a few traffic diverters caught my attention while biking today, I’m going to focus this post on traffic diverters, which is a traffic calming device. During my bike ride to experience Northeast Portland Sunday Parkways, which is part of a series of open street events, I biked through Holman Pocket Park, which may be the first street to park conversion in Portland history. In case you are wondering, local residents fully supported the street to park conversion with cheering during an open house meeting. The below video shows people biking through Holman Pocket Park. 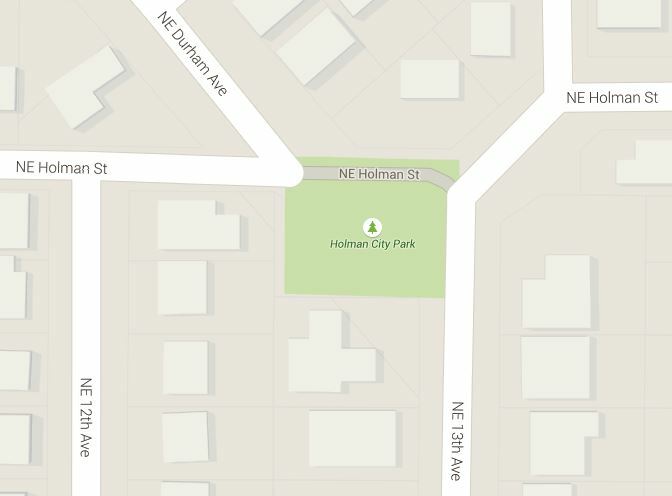 The below map shows where NE Holman St used to go through the park. For more information about the Holman Pocket Park transformation from a street to a park, visit the City of Portland’s website. 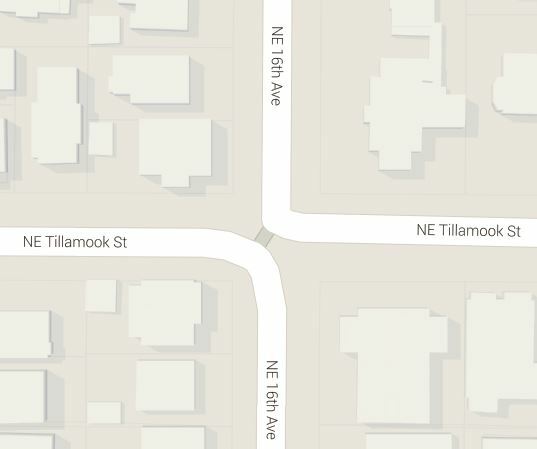 On my bike ride home from Northeast Portland Sunday Parkways, I couldn’t believe my eyes when I saw the diagonal traffic diverter at NE Tillamook St and 16th Ave because it is a permanent diverter. Many traffic diverters are temporary, which means they can be easily removed if people, especially motorists, don’t like the diverter. This is why I was impressed to see it is a permanent diverter. The below panorama shows the diagonal traffic diverter. Since I didn’t stay long enough to get a photo with a cyclist using the diverter, I found the below photo that shows cyclists using the diverter. The following map shows how the diagonal traffic diverter looks on a map. I talked with an elderly couple that was walking by when I was taking photos of the diverter. The couple said there are several other diverters in the Irvington neighborhood and they love how the diverters reduce cut through automobile traffic and make their neighborhood quieter. They walked away before I could ask how they felt about the diverters before the diverters were installed. From my experience with new infrastructure, people are often nervous about unfamiliar infrastructure so are usually against it until after the infrastructure is installed. I wouldn’t be surprised if the elderly couple didn’t always love the diverters. Speaking of history, I was able to find some history about the diverter. According to Shawn Granton’s photo description, the diagonal traffic diverter on NE Tillamook St and 16th Ave was the “city’s first traffic diverter. I heard it was first installed as a neighborhood guerrilla action in the late 60’s to calm traffic, then was made official by the city.” A comment on his photo suggests 16th Ave was “the main drag”. Since 16th Ave is no longer the main drag, the diverter was successful in making the neighborhood have less cut through automobile traffic. 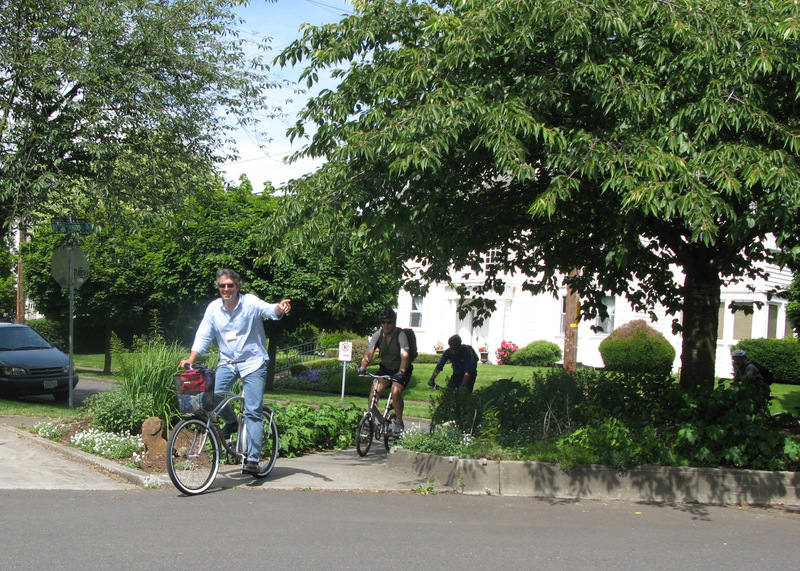 Even though it didn’t exist in the 1960s, the diverter helped make the Tillamook neighborhood greenway possible by reducing automobile traffic on NE Tillamook St while providing bicycle and pedestrian access. I constantly saw this in the Netherlands so it is great to see this in Portland. As you may have noticed, I haven’t finished blogging about everything I saw in the Netherlands. Fall quarter starts on September 28 so I have about two months to finish blogging about the Netherlands or else I will have to wait until after graduation next June to finish blogging. It feels great to write that I will finally be done with school soon! We toured transportation facilities in Rijswijk, Netherlands on Thursday, July 9. The below google maps tour shows the transportation facilities that we toured. 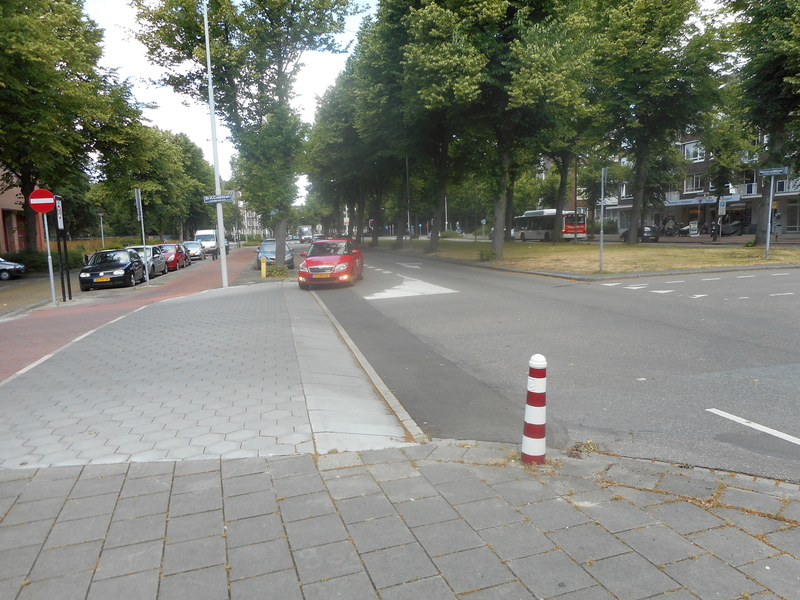 1) Delftweg, which is the old road from the Hague to Delft, has a bayonet traffic calming device to prevent through traffic and slow down motorists. The bayonet reduces the road to one direction at a time and has an “S” curve. 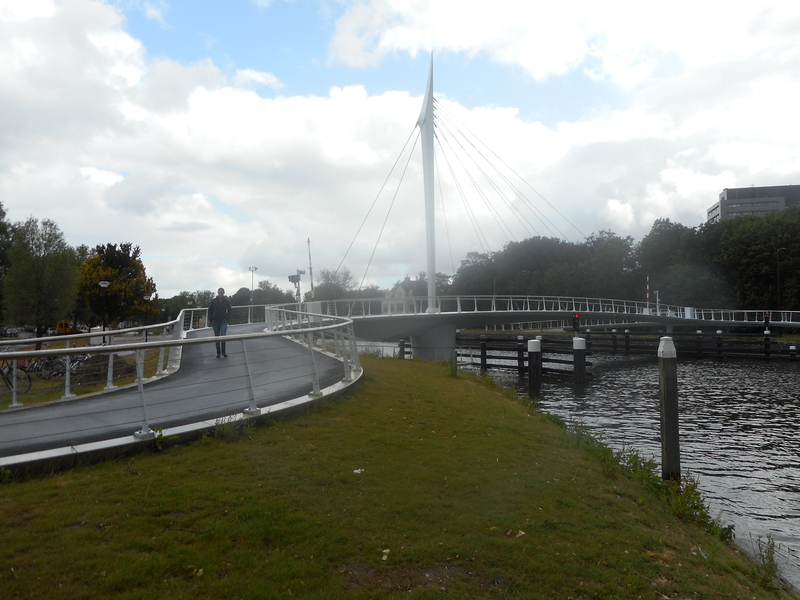 2) De Oversteek Bridge, which opened in 2014, is a bicycle and pedestrian only bridge. The Netherlands has a goal to create a bicycle network that has safe and convenient crossings within 500 meters of each other. This bridge helps to reach this goal by creating a more convenient canal crossing. 3) Rembrandtkade experienced a conversion from a street with a standard bike lane to a street with a cycletrack. The first photo below shows how Rembrandtkde was designed in 2008. The second photo shows the new design in 2014. With overwhelming support from the residents, which likely wouldn’t be the case in the United States, automobile parking was removed so trees could be replanted as dividers between every two parking spaces. With the space where the trees used to be planted, a cycletrack was installed. All of this was done without widening the existing right of way! 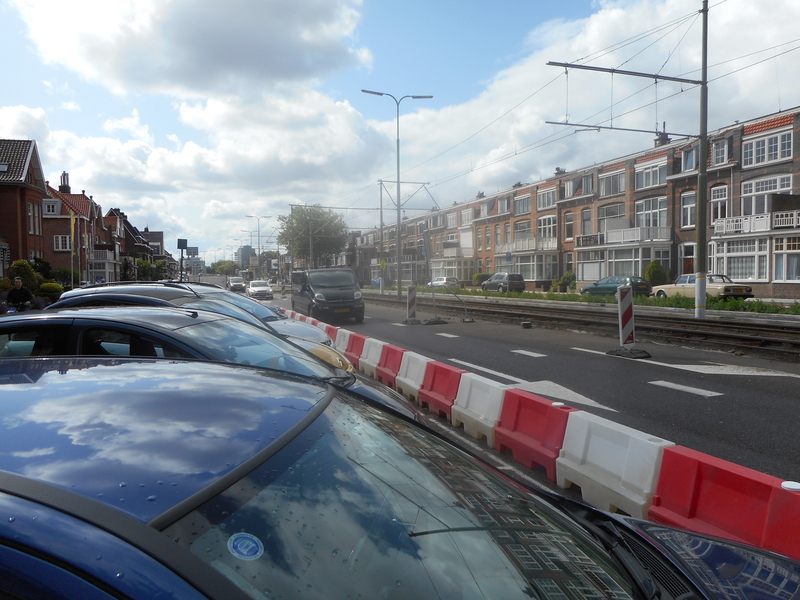 4) Haagweg is being converted from four lanes down to two lanes so the tram ROW can be widened. Local service roads are being added to the project so bicyclists can have a safe and comfortable through road. Motorists can only use the local service road for local access only. 5a) The Da Costa neighborhood has a splay diverter because the diagonal street was being used as a shortcut for motorists.The splay diverter was employed to reduce traffic on local users. The approaches from the left and right are both one-way streets pointed towards the device. At the intersection, each street is split so drivers must choose to go right or left. No through movements are allowed, and because the approaches are both one-way in, a driver can’t weasel around the barriers and keep going. Bollards are employed to enable cyclists to cut through. 5b) Even though signage is rarely effective for traffic calming (how effective are speed limit signs? ), signage has been effective for traffic calming in the Da Costa neighborhood. As the below street view screenshot shows, motorists can’t turn left or right at the intersection so are forced to proceed straight through the intersection. Cyclists are allowed in any direction. 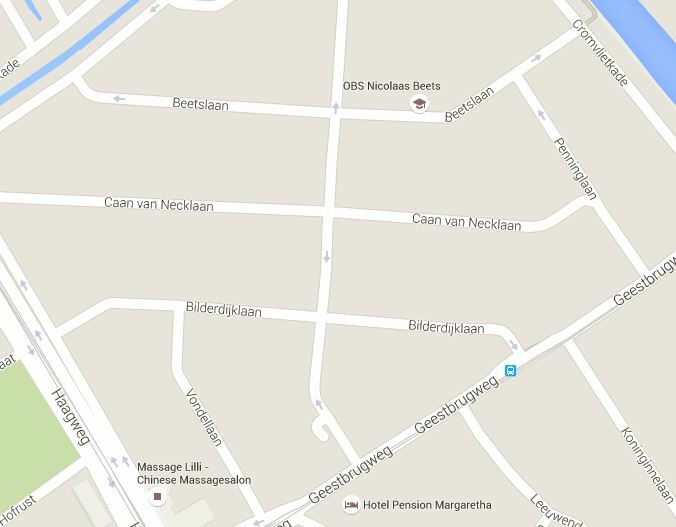 The below map shows the intersection of Bilderdijklaan and Da Costalaan with one-way street arrows pointing at the intersection. 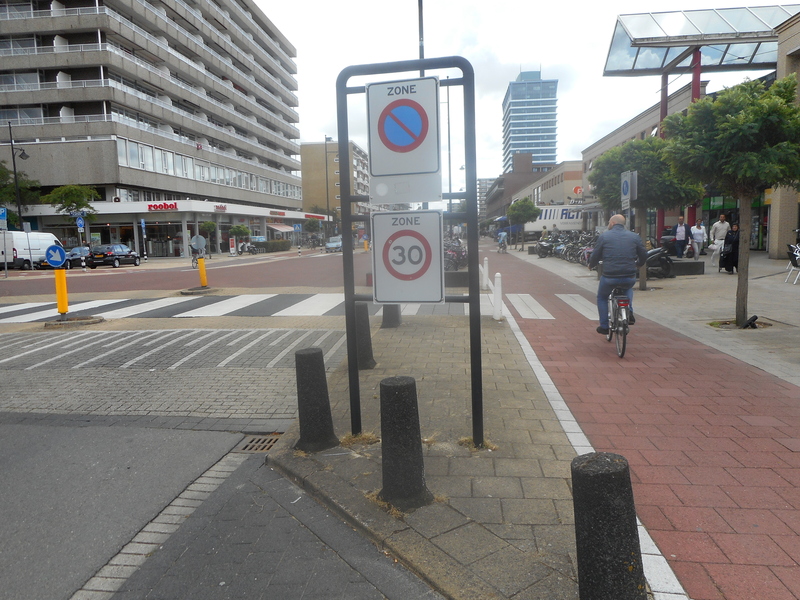 6) We only stopped in the old center of Rijswijk for a minute so I didn’t have time to take any photos. 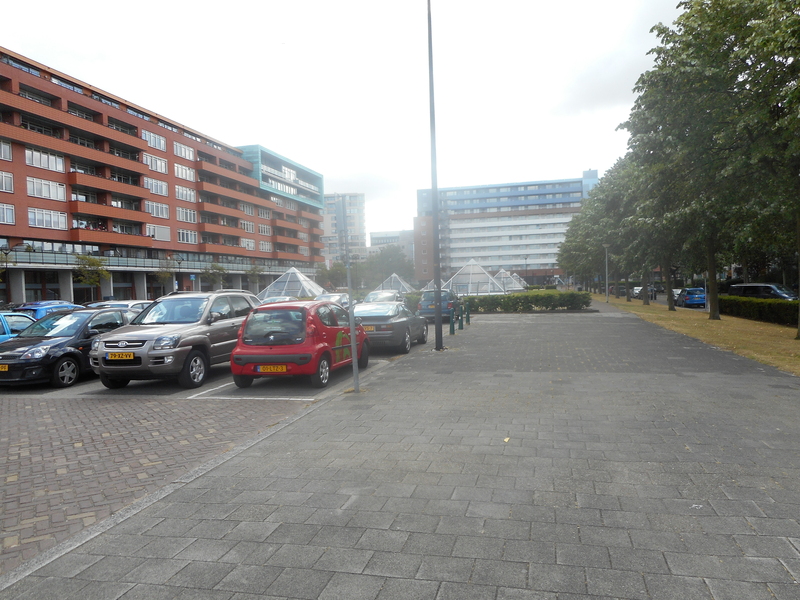 The old center of Rijswijk is a pedestrian mall so most automobiles are prohibited. 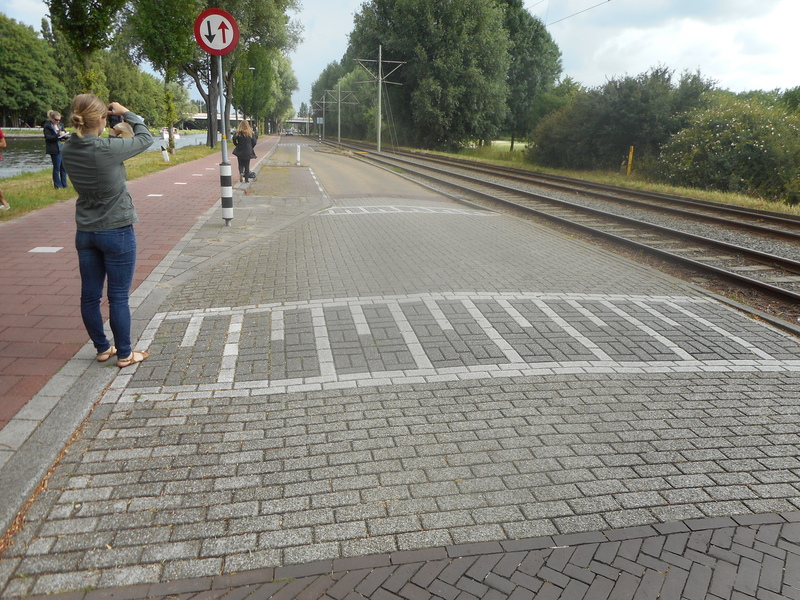 7) The Netherlands has been doing amazing things with roads that were designed for automobiles. Huis te Lindelaan, which is a main arterial from the 1960s, now has cycle tracks on it. In addition, as the below photo shows, Huis te Lindelaan had a road diet to create one-lane crossings. I find it interesting how there is automobile parking on the main arterial and the service road because I believe automobile parking should only be on the service road. Main arterials are only for through traffic so motorists should drive onto the service road before parking. 9) Steenvordelaan, which is an access road to the shopping center, had its speed limit reduced to 30 km/h and transit friendly traffic calming implemented. 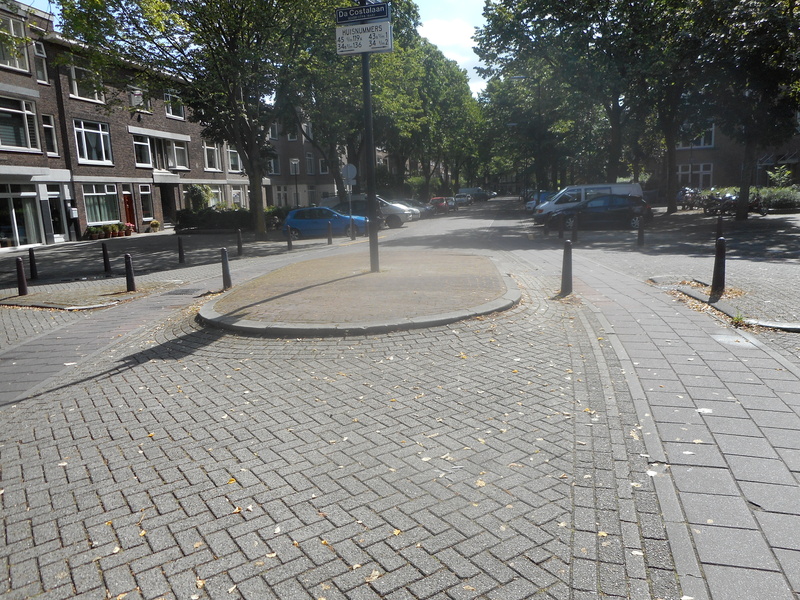 10) Sir Winston Churchilllaan road diet at Eisenhowerplein. Sir Winston Churchilllaan used to be a huge road with a horrendously long crosswalk. By reducing traffic to one lane in each direction, and adding pedestrian refuges between each lane and between the road and tram tracks, the distance was broken down into manageable segments. Traffic modeling showed that since this area was primarily governed by the signals on either side of the segment, and not the pedestrian crossing in the middle, that the flow would be relatively unaffected by a reduction in lanes. I’ve been getting sicker since last week so it has been challenging to bike and participate in course activities. When I arrived at my apartment after class over the past week I went straight to bed so now I am behind on blogging. My coughing got worse yesterday and a 30+ mile group bike ride was planned for today so I had to miss my first group bike ride. Hopefully I can ride tomorrow in Houten. 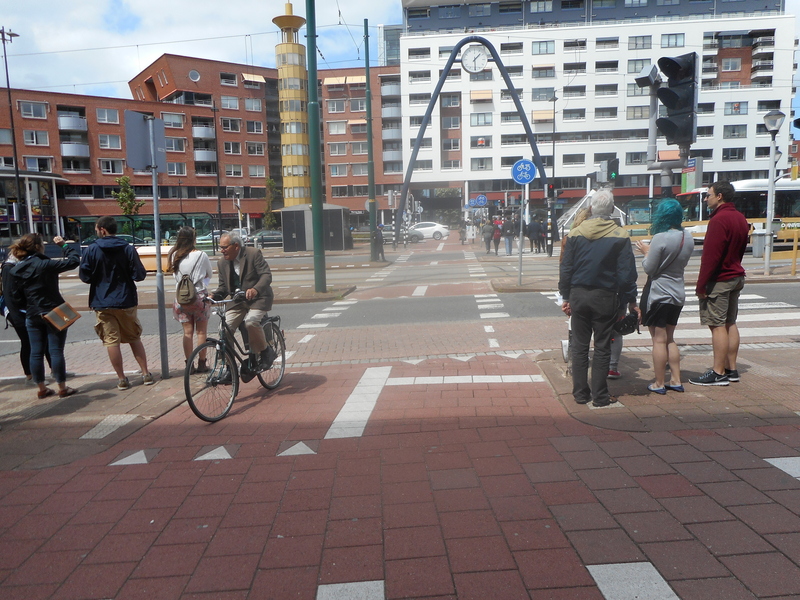 Last Wednesday, July 8 we went on our second Delft facility tour with a large group of students from Northeastern University to visit bicycle and pedestrian only underpasses and bridges, standard bike lanes, and advisory bike lanes. As with the first Delft facility tour, details about the facilities can be found in the below map and on the Northeastern University blog. I’m responsible for writing about one facility and providing a comparison to the United States. Since advisory bike lanes are rare in the United States, I chose to focus on advisory bike lanes. The below photo shows how an advisory bike lane works. As Peter Furth made clear to our class after almost every student misunderstood how the street works, the photo is incorrect in calling the center area a “lane” because the entire street is a shared-use space and has no travel lane. Travel lanes are usually understood to be for one direction and for one column of travel. Streets with advisory bike lanes have shared-use space because motorists are allowed to merge into the advisory bike lane when navigating an oncoming motorist. 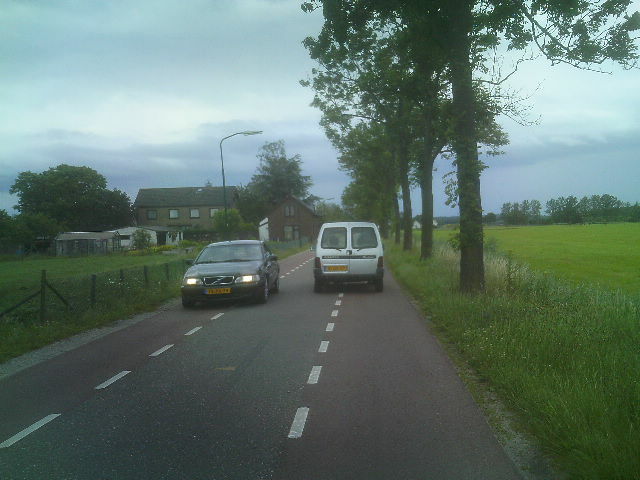 The below photo is an example of two automobiles navigating advisory bike lanes on a rural road near Utrecht, Netherlands that I took during my previous study abroad trip. 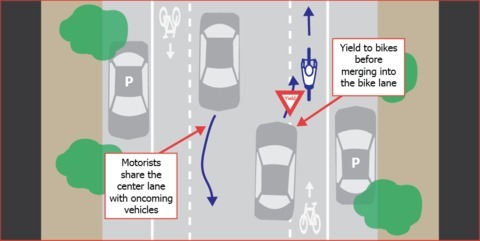 The use of two advisory bike lanes instead of two travel lanes forces motorists to pay attention (motorists have to navigate oncoming traffic since they don’t have an entire travel lane to themselves), which forces motorists to slow down (motorists aren’t going to speed when they have to navigate oncoming traffic). Even though motorists and cyclists likely don’t think about how much safer they are when motorists slow down, advisory bike lanes increase the likelihood that motorists and cyclists will survive a crash because motorists are forced to go slower than they would be if they had an entire travel lane to themselves. The below infographic explains how people are more likely to live if we build our infrastructure to force motorists to slow down. Since cyclists have the advisory bike lanes to themselves and motorists are required to yield to cyclists when using advisory bike lanes to navigate oncoming traffic, cyclists are not forced to pay attention or slow down. Even when there isn’t oncoming traffic, motorists in the Netherlands try to give cyclists as much space as possible. 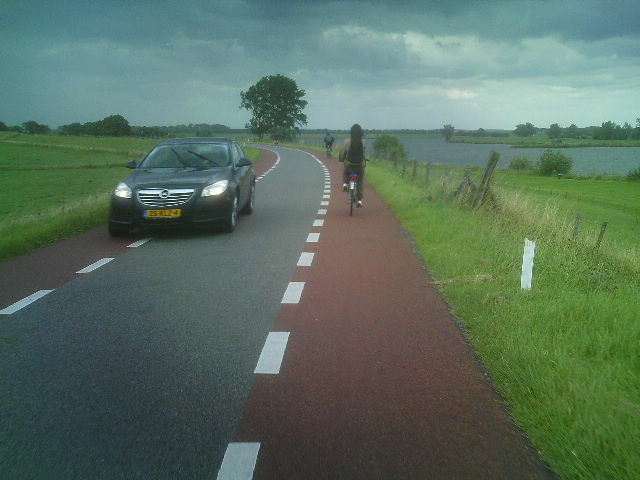 The below photo, which I took on a rural road near Utrecht, shows a motorist moving into an advisory bike lane so my classmates can feel safer while biking in the other advisory bike lane. In addition, notice how there is no center line and the advisory bike lanes are red. Coloring bike infrastructure in the Netherlands is very important because it guides cyclists to where they need to ride and informs motorists where to expect cyclists. This appears to work better than the “Bikes May Use Full Lane” signs in the United States because cyclists are now predictable, which is important for all street users. 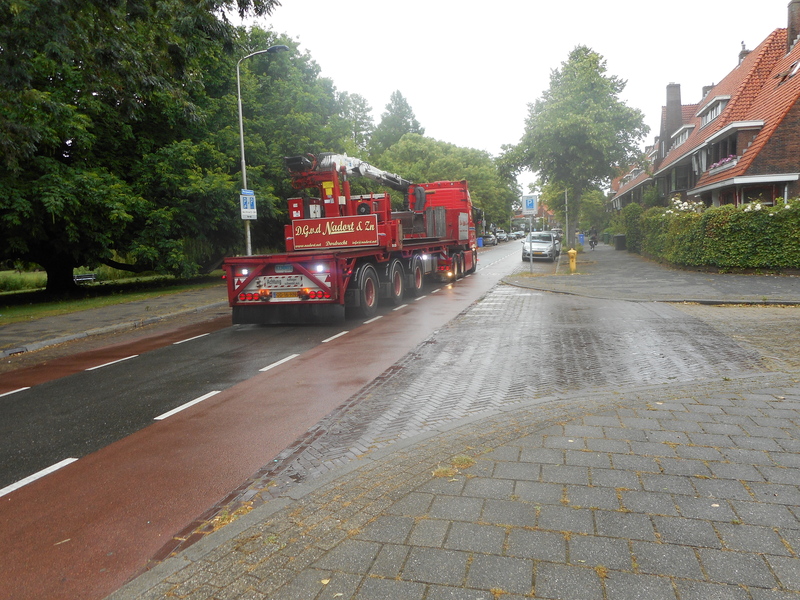 As the below photo from Delft shows, advisory bike lanes are just as common on urban streets and can be used by large trucks. While I didn’t see any oncoming traffic try to navigate around the large truck, I assume there is enough space for a car to maneuver around the large truck. Even though the truck driver probably doesn’t enjoy driving on streets with advisory bike lanes, the truck driver is forced to slow down, which saves lives. Since the Netherlands prioritizes safety over speed, everything in the Netherlands is about slowing automobiles and making streets and roads safe for all users. If I am understanding advisory bike lanes correctly, I believe advisory bike lanes can be installed on streets with “Bikes May Use Full Lane” signs or sharrows because these streets don’t have enough space for a standard bike lane. Even though Peter Furth’s 2009 report on Bicycle Priority Lanes: A Proposal for Marking Shared Lanes is recommending the use of bicycle priority lanes, the inspiration for bicycle priority lanes is the suggestion lane (AKA advisory bike lane). This means that he supports the use of advisory bike lanes on streets that don’t have enough space for a standard bike lane. 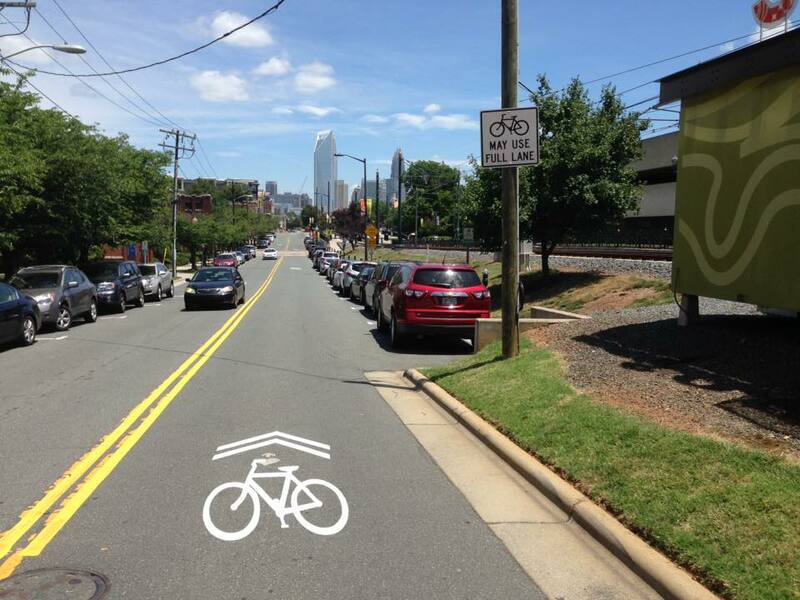 While I don’t have the cross section measurements, the below photo shows an example of where I believe advisory bike lanes could be installed in Charlotte, NC. The next step in understanding the feasibility of installing advisory bike lanes in the United States is discovering whether the Manual of Uniform Traffic Control Devices (MUTCD) allows the traffic control device. 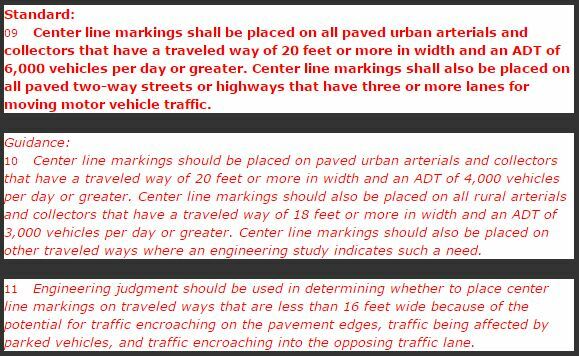 According to Peter Koonce’s blog post about advisory bike lanes, the MUTCD requires the use of a center line in the following cases so advisory bike lanes could not be installed where a center line is required..